Giorgione et al...: Giorgione: "Saturn Exiled" or "Man of Sorrows"
Giorgione: "Saturn Exiled" or "Man of Sorrows"
"Saturn Exiled" or "Man of Sorrows" National Gallery, London. 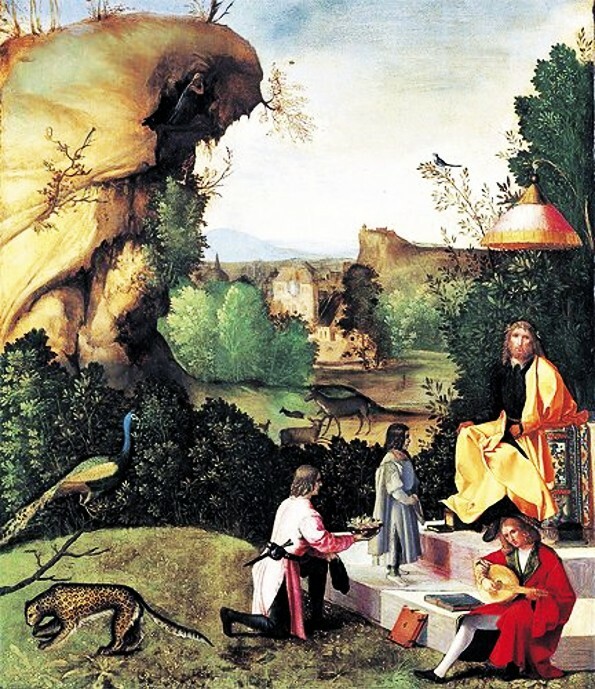 In his monumental 2009 study of Giorgione*, Enrico Maria dal Pozzolo began his discussion of the individual paintings with a work that is not usually given to the master from Castelfranco. 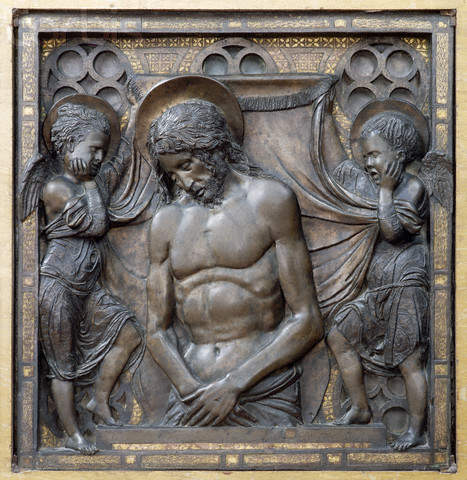 Pozzolo believed that this medium-sized panel (59x 48 cm), now at the National Gallery in London, “might be the first of Zorzi’s works to have been handed down to us." He called it a “bizarre” painting and pointed out the difficulties surrounding it. He noted that some have believed the main figure is David or Solomon, while others have argued for Jason or Zeus, or even an indistinct “Poet.” Then, Pozzolo himself went out on a limb and made an astounding assertion. But the main figure is none other than Saturn, the god who devoured his own children, was castrated and denounced by Zeus, represented here in decline and exile in a hortus conclusus inside which human beings and animals live together in peace, all within the bounds of a “virtuous “laurel shrub…. Enrico dal Pozzolo is one of the world’s foremost Giorgione authorities and I have no problem agreeing with him that this work could be an early Giorgione. His interpretation, however, leaves much to be desired. He himself admits that even on those rare occasions when painters depicted Saturn, he was never shown as in this painting. It seems much more likely to me that this painting is a version of the “Man of Sorrows” in a landscape filled with iconographical elements that Venetian artists like Giorgione loved to employ. 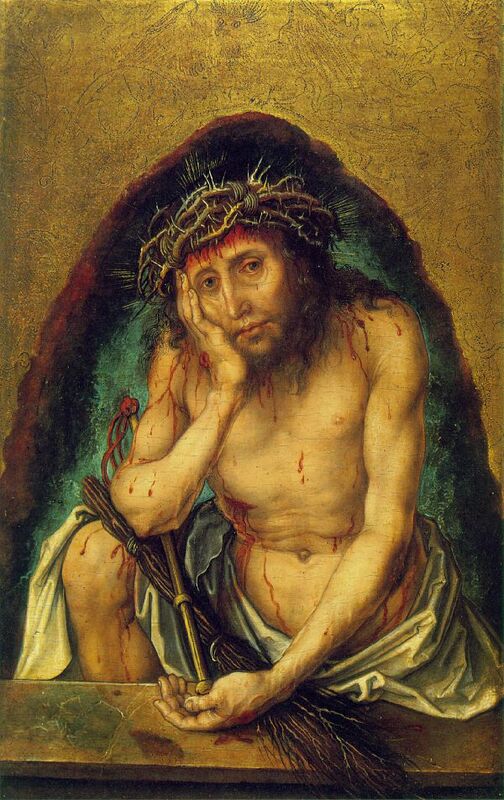 He has the same sorrowful visage of the “Man of Sorrows,” and looks out at the viewer in the same way that so many others do. He wears a royal golden robe and sits on a throne placed upon what could easily be the steps of an altar. MOBIA is a unique museum located on New York’s West Side at 61st St. and Broadway, right off of heavily trafficked Columbus Circle. MOBIA has no permanent collection of its own. Originally created by the American Bible society a little over a decade ago, it is now an independent entity that puts on exhibitions inspired by Biblical themes. These exhibitions are put on in one large exhibition room on the second floor of the American Bible Society headquarters. Its origins rooted in Byzantium, the figure entered Venetian art in the late Middle Ages after which it flourished locally for centuries, eventually acquiring its own name in dialect, Cristo Passo. The first thing to note about the subject was its ubiquity. “Cristo Passo” was obviously popular in Venice but the exhibition had works from all over Europe. Moreover, the image appeared in all different types of media, “Illuminated manuscripts, paintings, prints, sculpture, and liturgical objects." 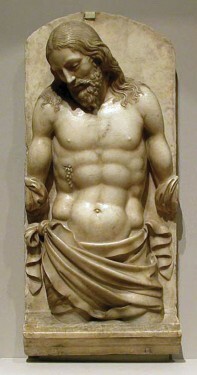 There was even a striking polychrome paper mache relief based on a Donatello pictured here. 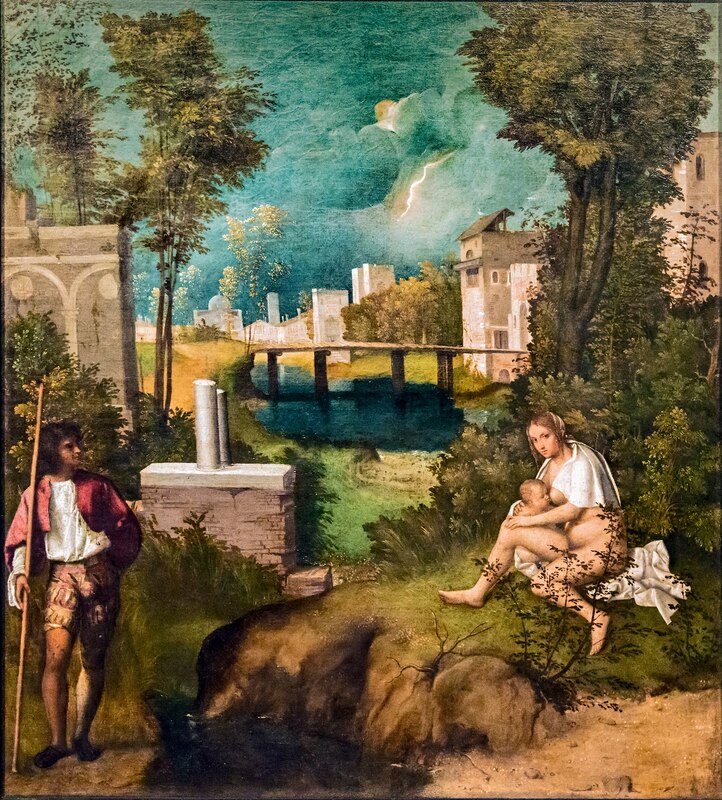 To go through the exhibition was to realize that Bellini, Giorgione, and Titian were just the tip of the iceberg working in Renaissance Venice and its environs to satisfy the enormous public and private demand for devotional images. The next thing that struck me was that all the images, despite their obvious differences, were basically the same. It was as if all these artists, the great and the not so great, all used the same model, especially when it came to the head of Christ. Even without his cruciform halo, he is easily recognized. He is a man who has suffered, who has been beaten and humiliated, and whose head slumps to one side, usually his right. His beard is short and pointed albeit ragged. Artists could not depart far from this model. 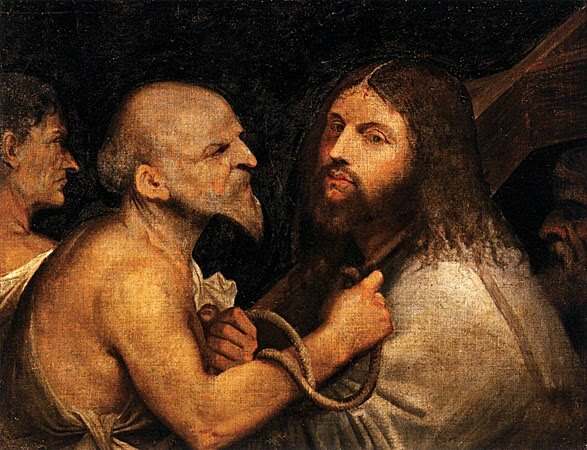 In addition to the "Saturn Exiled" that Dr. Pozzolo placed at the very beginning of Giorgione's career, the famous “Christ Carrying the Cross” that I discussed in a previous post could also be a depiction of the "Man of Sorrows." Vasari claimed that this painting had miraculous healing powers from the time it was first unveiled in the Scuola di San Rocco. Unfortunately, Vasari originally claimed that Giorgione did the painting, but in his second edition he gave it to Titian. Since that time scholars have not been able to resolve the question of attribution. Ours the sufferings he carried…Yet he was pierced through for our faults,Crushed for our sins.On him lies a punishment that brings us peace,And through his wounds we were healed. The MOBIA exhibition demonstrated that every Venetian would have immediately recognized the figure in the painting in the National Gallery. *Enrico Maria dal Pozzolo, “Giorgione”, Milan, 2009. **Edit. 11/2/2013. Please notice the baldachino above the head of the Man in Giorgione's painting. It looks somewhat like an ornate lampshade. In a recent exchange with David Orme, an English friend and lover of Venice, he told me that he had seen similar fixtures still existing in Venice. Below is an image supplied by his friend, Albert Hickson. It covers a Madonna and Child on the Rio Ognisanti near San Trovaso. Many thanks, David and Albert. Might be a decorative luxury influence brought back from Asia by Marco Polo. The "Man of Sorrows" idea. I like it. The painting very much a cartoon of Jesus being handed offerings and luxuries without meaning. Much in tune to protestant reformation ideas protesting the forgiveness of sin through purchase power. I do not believe that Renaissance artists put things in their paintings without meaning. Even small details often are there for a reason. The Man of Sorrows can be found all over Europe in the fifteenth century. thanks for your comments.